Soldeu.com was launched in March 2009 with the objective of providing quality, resort specific information about Soldeu and El Tarter that visitors can trust to plan and book their ski trips. The site was founded by Andorra ski enthusiasts Steve Hull and Emma Staples-Hull who first arrived in Andorra back in 2005. It is important to us that the information we provide is accurate, helpful and updated regularly by our expert in resort team, offering our visitors great insider information about the resorts and ski areas of Soldeu and El Tarter. Soldeu.com was the third website created under the specialist Andorra Resorts brand. The first website Arinsal.co.uk was launched in winter 2007-08, with the second Pasdelacasa.com launched in January 2009. As the series of websites has grown, so has our team, we regularly ski every corner of the mountain, eat in the restaurants and enjoy a beverage or two in the local bars, as well as use all of the other amenities in the resort. Through Soldeu.com we hope to provide you with a local insight that will inspire and assist you in creating your perfect ski holiday. Scroll down to meet the team. Our long-standing relationships with the mountain operators, ski schools and other local suppliers have allowed us to negotiate some of the best and most flexible deals for the benefit of our customers. Partnerships have been created with Ski Calbo in Soldeu and Nordic Esports in El Tarter, to offer our customers excellent discounts on the rental of quality ski and snowboard equipment. Before setting up Soldeu.com we worked with both Sports Calbo and Nordic Esports for several seasons so are confident in the quality and service provided. Naturally we also work very closely with Grandvalira in order to offer lift passes and group lessons, so our visitors can easily book all of their ski extras here in one place, whilst benefitting from our great money saving offers. We offer both shared and private transfers from a number of surrounding airports and stations, plus a selection of hotel and self-catering accommodation across Andorra, so you can build your own tailor made holiday with us. We are a small team of Soldeu experts, who take great pride in sharing our knowledge of the resort and helping our visitors book the perfect trip. After growing up in Yorkshire and graduating with a degree in tourism management, Steve has gained 15 years of experience in the travel industry, working throughout Europe as well as in North America. 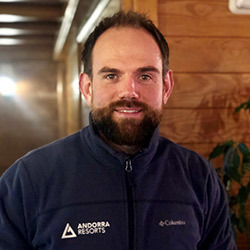 Steve first worked in Andorra in 2005 and after working here as a manager for tour operators for three winters, founded Andorra Resorts in 2008 putting together his knowledge of computers with experience of the mountains. Having skied for over 20 years, Steve loves getting on the slopes, and spending many winters in Andorra means he has a great knowledge of the country to pass on through the series of websites. Originally from South Wales, Emma has worked in the travel industry for 13 years, travelling extensively whilst working in Europe, Africa and South America for a well-known tour operator. 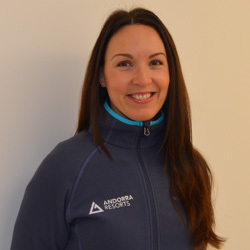 Prior to setting up Andorra Resorts with Steve, Emma worked as Country Manager in Andorra for an online ski specialist, her in-depth experience within the industry, particularly within Andorra brings a wealth of knowledge to Andorra Resorts. 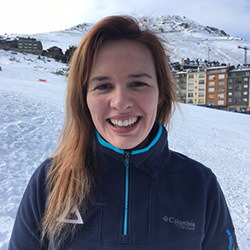 Emma is a fluent Spanish speaker and is passionate about all things travel, sport and fitness related, it goes without saying that she is a keen skier! Derbyshire has been Rebecca’s home throughout childhood and, starting on the Chatsworth Estate, she has been in the customer service industry for 6 years. After studying Spanish, she spent time working in Spain before moving to Canada for 2 years. 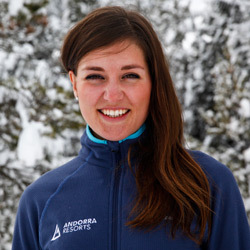 In Canada Rebecca had her first taste of mountain life and loved it becoming a level 1 snowboard instructor as well as gaining a range of experiences working in the tourism industry. She then moved to Banff and worked for a major Canadian company as a vacation planner while hiking and camping in the mountains in her spare time. Rebecca enjoys meeting new people, outdoor adventures and taking on new challenges. After graduating from University in 2015 with a history degree, Ellen embarked on a solo travel trip around Southeast Asia, Australia and New Zealand for just short of one year. During this trip she spent five months in New Zealand where she learnt to snowboard in Queenstown, whilst also working in a ski/snowboard equipment hire shop and a popular backpacker hostel for the winter season. Prior to her travels, Ellen worked in a leading UK department store for six years and more recently worked an administration office-based role at her local university. Aside from snowboarding, Ellen is a keen sea kayaker and also enjoys climbing, hiking and almost any adventure sports which involves building friendships with new people and being in the great outdoors. Hailing from North Devon, Ian has over 15 years experience in the hospitality industry, with the majority of the last 10 years spent working overseas for the world’s largest tour operator. Having worked in diverse destinations such as France, Spain, Egypt and the U.A.E Ian’s passion comes from the enjoyment of delivering unforgettable experiences. Ian first worked in Andorra in 2007 and since then has spent 5 winter seasons living and working in here. An advocate of the country and local people he wants to take his knowledge of the county and it’s ski areas and allow as many people as possible to enjoy it as he has. The information contained on this site is provided as a guide only and is correct to the best of our knowledge at the time of writing. No responsibility can be accepted due to loss or inconvenience caused by errors. If you spot any mistakes please use the contact page so that they can be updated. The descriptions of accommodation have either been submitted by the owner/manager of that particular accommodation, or copied from their website, and do not constitute a recommendation by Soldeu.com. The accommodation owner/manager is responsible for the accuracy of descriptions. Thank you for visiting Soldeu.com and we hope you find the information here useful. If there is anything you think would be a useful addition please let us know. Soldeu.com & Andorra Resorts are trading names of Travel Booker Limited, registered in England & Wales with company number 6916818. Our registered address is Creative Quarter, Morgan Arcade, Cardiff CF10 1AF. Telephone: +44 (0) 2921 286655.